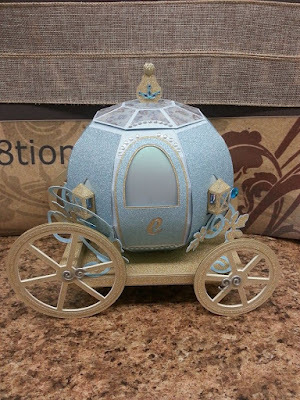 After making my more pumpkiny carriage, I thought it would be fun to make one that was more like the one in the Walt Disney's Cinderella movie. This was the end result. It was given to my granddaughter. I used glitter paper from DCWV Shimmer stack, and a mat size from Once upon a time, also from DCWV. The little lanterns needed to have little rectangular pieces of gold glitter paper put inside so the white didn't show so much. I glued pieces on the back and bottom. I added the letter "C" to the door. 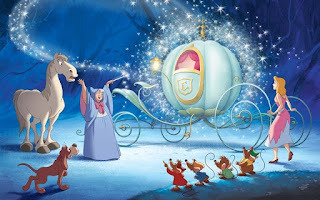 It's on the Cinderella coach, but could be for my granddaughters name too. It was the Forte font. I had to do some hunting for the crown sticky jewel on the lid. I finally found some at Michaels. The glitter paper does cause a challege when gluing. It takes a little more time to adhere. (I don't have much patience.) 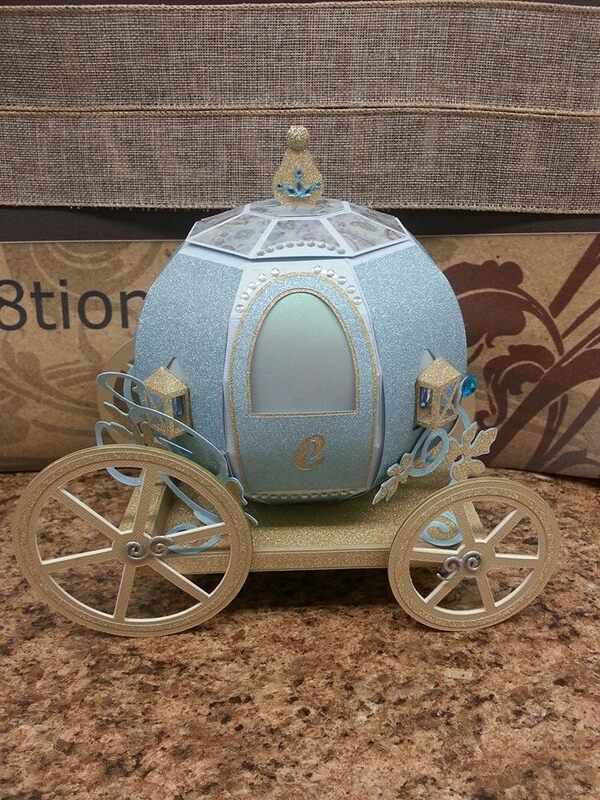 In the end I was very pleased with my carriage, and I hope it's something my little princess will enjoy for years. 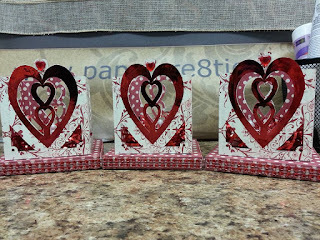 Cut Once and Craft for a Week. With the addition of two grandchildren, my crafting time has been drastically reduced. I get an hour here and there to put a small project together, but not the real craft time I desire. In a effort to get more projects done, I decided to borrow an idea from some busy mom blogs. "Cook once, eat all week." 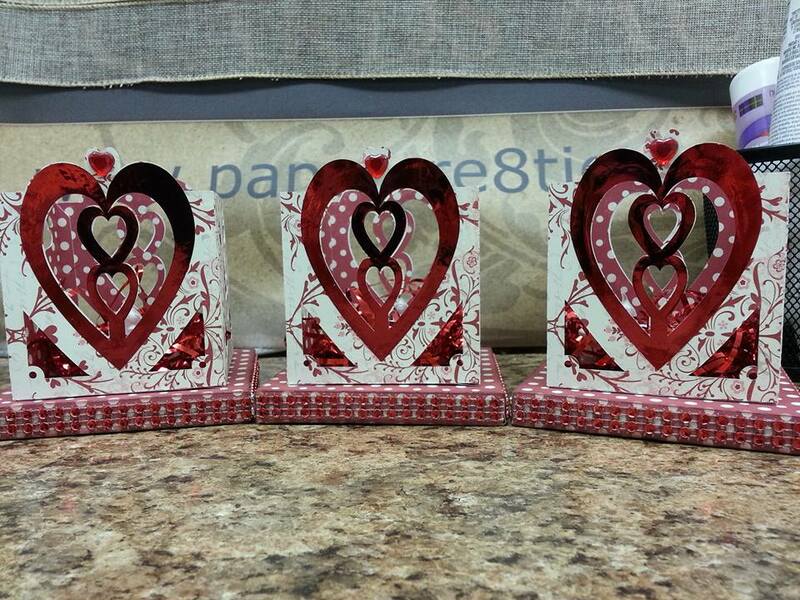 So this week, I am cutting once to craft all week! The Bunny Hop kit by SVG Cuts from a few years ago, has one of my favorite projects for Easter. I love the Bunny box! I made all the grandkids one several years ago, but with new family members, everyone is getting a new bunny. 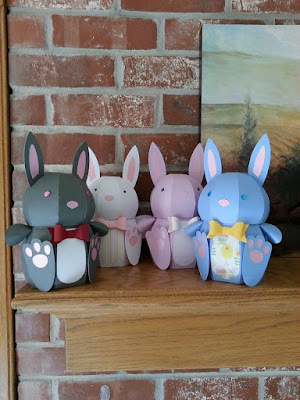 I have papers picked and I'm cutting out 8 bunnies to put together this week. It's the setup process that takes me the longest. Although this project is easy to pick paper for, cutting and weeding still take a while to do. It seems I can be in my craftroom, unbothered, for several hours on Friday nights! I have two more bunnies to cut out, so I shall get back to it! Have you been to the Dreaming Tree website yet? If not, get over there fast! They have several totally free svg files to download. And right now, they will give you a gift card worth $2.99 to their website, just for making one of the free SVG files! How crazy is that?!?! But that's not all....if they get to 15,000 facebook likes before the promo ends, they will have a cutting machine give away. To enter, you just have to make the free file and enter to receive the gift card! So, here is the link to get the free file (Click here). And here is the link to enter once you make the Clover Treat basket (Click here). Be sure to go to their facebook page and give them a like! The sooner they get to 15,000, the closer we'll all be to winning ! Someone may be wondering where I disappeared to, so I thought I would take a minute and update by blog. In September, a new grandson was born. Then in October, and new granddaughter was born. I watch the grandson and his sister (who turns three in a few days) Monday through Friday and I watch the new granddaughter about 2 Saturdays each month. That doesn't leave much time or energy for crafting these days. I do manage to sneak in an item or two here and there. I did make a free file from Dreaming Tree for preschool teachers. It was quick and very easy, but looks so nice! The papers are from my stash. I got them several years ago. Makingmemories Je t'adore. And foil paper I found by chance at the Dollar Tree. It's called Do It Yourself Projects Holographic and Foil Sheets by Jot. It came with 20 sheets of varying colors. I was shocked. It cut very nicely. The trim around the bottom was from Micheals. It's called Fabulous Finds Adhesive Trim. 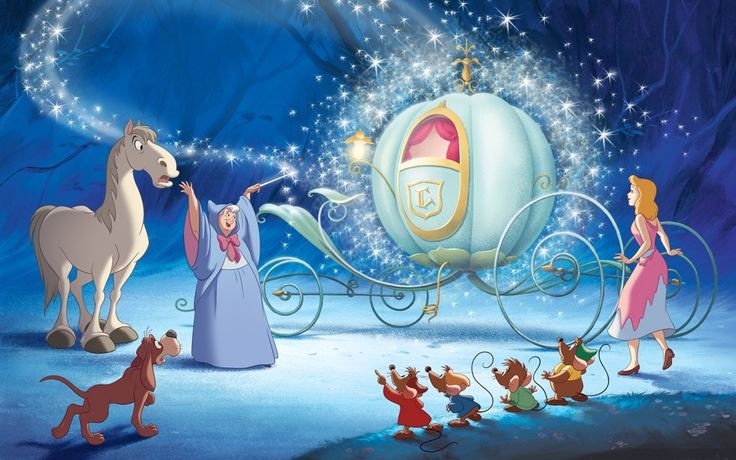 It's a really fun touch that looks so sparkly. I hope to get a rhythm back for more crafting soon.